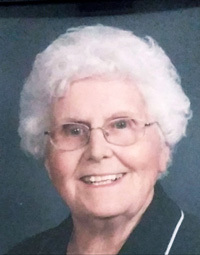 Mary Jean Flohr, 94, formerly of rural Benson, passed away on Sunday (Jan. 20, 2019) at Haven Hills nursing home in Lodi, Wis., where she was a resident. She was born Oct. 30, 1924, in Minonk, to Gilbert and Marie Broers McKeon. She married Theodore Arnold "Arnie" Flohr on June 26, 1945, in Minonk. He passed away Jan. 8, 1994. She is survived by her daughter, Susan Flohr Miller; daughter-in-law, Pamela Weld Flohr; one sister, JoAnn Broecker; one brother, Dale McKeon; one granddaughter, Kirstin (Matt) Alsaker, two grandsons, Thad (Alicia) Flohr and Garrick (Donya) Flohr; four great-grandchildren, Erik Alsaker and Mauna, Gareth, and Katarina Flohr; her aunt, Marjorie Cullen; special friend, Mrs. Lynn Deans, Dane, Wis.; and many nieces and nephews. Jean was preceded in death by her parents; her husband, Theodore Arnold "Arnie" Flohr; one son, Lynn Arnold Flohr; one grandson, Erik Jon Bjork; and two brothers, Robert McKeon and Merle "Mike" McKeon. A World War II veteran, Jean proudly served in the U.S. Army as a WAC (Women's Army Corps) in 1945. Jean taught elementary school for the Roanoke-Benson Unit 60 School District until retirement and is revered by her former students. Jean was a voracious reader and an "ace" at crossword puzzles. She enjoyed crocheting afghans as gifts for family and friends. Her attributes of strength and perseverance made her a role model to many. Always thinking of others, her generosity of spirit was monumental. Jean was a member of St. Peter Lutheran Church in Benson where her funeral will be at 2 p.m. Saturday. Pastor David Abuya will officiate. Visitation will be from 12:30 to 2 p.m. Saturday prior to the service at the church. Burial will be in the church cemetery. Memorial contributions may be made to St. Jude Children's Research Hospital, Midwest Affiliate. Knapp-Johnson-Harris Funeral Home, Roanoke, is handling arrangements.